Washing the Dead is both a personal story of growth and a generational saga examining chain-of-events and how the mother/daughter relationship becomes such a broken, needy thing. Barbara Pupnick grows up in an enclave of Orthodox Judaism with a mother devoted to the synagogue and best friends with the Rabbi’s wife. Her world is perfect, her place marked, her belonging unquestioned, and her status irrefutable – or is it? A beautiful mother haunted with secrets and an affair with the Shabbos-Goy (a gentile – read non-Jewish – worker at the synagogue) challenges everything Barbara has ever known. Her religion is in question, her social standing, her friendships (including Tzippy, her best friend, the Rabbi’s daughter), her family, and most importantly, her perception of the world and expectation of parental loyalty. If your own mother can betray you, if your own community can throw you out, if everything you have ever had or stood for can suddenly dissipate, where is the safety in such a world and where is the assurance of love? If your own mother won’t sacrifice for you, who will? If your own mother won’t love you, what then? If your friends won’t stand by you, if your religion deserts you, if your community makes you an outcast for your parent’s action, is anything really lasting or assured? Now a grown, married woman, living away from the orthodox world, eating pork, wearing jeans and t-shirts, Barbara is recalled to her community once again by the Rabbi’s wife, the very woman who affected her communal disownment. A beloved and influential childhood teacher has died and the ritual washing performed before a funeral falls to Barbara, if she can stand the re-introduction into a vanished world. Meanwhile, Barbara’s rebellious mother is growing senile and needs a place to stay. Fighting with a past that never would be laid to rest, Barbara risks her own parental bond with her needy daughter. Perhaps history does repeat itself. Perhaps she was never that different from her own mother. 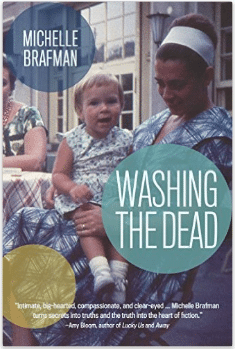 A hypnotic journey between the present and the past, Washing the Dead is an initiation into Barbara’s interior world and a dialogue about parental failure from multiple viewpoints. Just as Barbara confronts her own silent mother, she questions her actions and reactions toward her child. Judgment is more difficult from her perspective in life now, yet the abandonment and the secrecy have left deep wounds. She must stich them slowly, painfully together over time as she confronts her fears and her mother’s hidden past. A sleeper tale of emotions, Washing the Dead touches on all our deepest fears: what if our mothers had abandoned us, had taken away our community and trust? What if their love was a question and their rejection inexplicable? June, Barbara’s mother, remains an enigma, closed and stand-offish. Barbara herself must find the answers while confronting the community protectiveness that surrounds her seemingly in-the-wrong mother. The aspect of Orthodox Judaism is well handled and brings deeper meaning to each action, specifically the ceremonial idea of washing the dead and the respect it engenders. The calm of the waters contrasts with the violence of emotions; there is an undercurrent to the rage and bitterness, something almost understanding yet fragile and extremely painful. The explanations of orthodoxy and the associated rituals, along with the requirements of everyday life guide readers through this world in an effortless, dare I say almost mystical manner. Ultimately, our intimate knowledge heightens the sense of complete loss and the lack of stabilization. Barbara’s escape from long skirts and a ridged diet mean more to us and while her teenage self may see the freedom, we recognize the isolation and confusion. If there is no backbone to life, no rules, no definites, how can Barbara find her way? The oscillation of time back-and-forth builds the most tension and the biggest mystery. Exactly what is wrong with June and why the Shabbos-Goy? Why throw everything away? Who do family and friends protect June yet seem callous toward Barbara’s natural rage? The memories of discovery are just as vivid, just as present, as Barbara’s daily teaching job, and her recollections reveal how much she lives in the past. It’s painful and addictive. The presentation, the down-to-earth quality of Barbara who will admit to oniony smelling skin and debilitating fears breathlessly draws readers into a mega story. Covering a lot of ground and decades of time, Washing the Dead has the thematic appeal of an epic as it draws three generations into a crisis point, meeting and overlapping one another. It’s a quiet story that pulls at the heart, addicting, painful, redemptive in its way. Reading this novel will always stay with me on two levels: the ease of the style and the realness of Barbara’s emotions. Washing the Dead is a family story on the outside, but one woman’s journey to and away from her family on the inside. Emotional and subtle. Highly recommended.